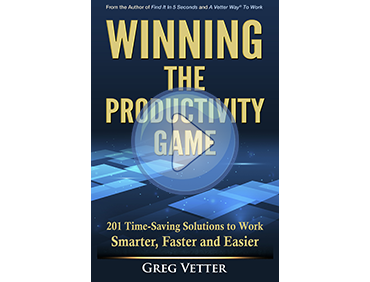 LICENSING | Vetter Productivity, Inc.
Vetter Productivity can assist you in creating a more productive organization for the 21st century. The goal of the Licensing training is the standardization of as many procedures and systems within your company as possible including how to process, store and access information and how to create a standardized office operating system for how your people work. Not only will there be a tremendous cost savings by being licensed and using your facilitators, but you will have trainers who will already be familiar with your culture, terminology, and environment. The training can be customized by combining your guidelines and goals with the concepts from the A Vetter Way® system. The cost savings are quite substantial over a normal training. Facilitators, your employees, offer a distinct advantage, because they know your organization and business practices inside out. Facilitators can train your employees an unlimited number of times without incurring any additional costs. In-house facilitators can set up a more flexible training schedule for your organization. Participation in the entire, initial, five-day management training with other employees. A seven-day facilitator training program with intensive study and hands-on practice in a real life setting. 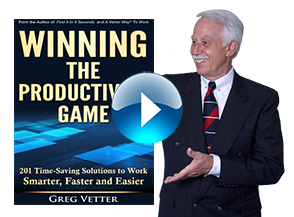 Greg Vetter, founder of A Vetter Way® personally trains all facilitators. All training materials: PowerPoint presentations, workbooks and facilitator manuals. Annual updates to all training materials during the license period. Feedback on the selection and development of facilitators. Unlimited phone consultation during the license period.